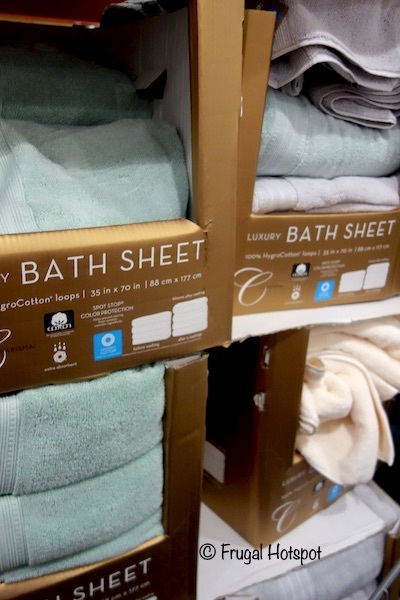 These 100% Hygro cotton towels get fluffier after a few washes. 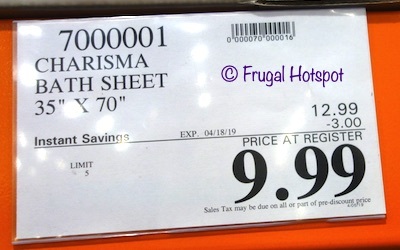 Select Costco locations have the Charisma Bath Sheet 35” x 70” on sale for $9.99 (after instant savings), now through April 18, 2019. That is $3 off Costco’s regular price of $12.99. While supplies last. Item #7000001. Color selection, price, participation, and sales dates may vary by location. This product was spotted at the Covington, Washington Costco. It may not be available everywhere. • HygroCotton is exceptionally absorbent and stays soft wash after wash. Colors may include white, cream, pale green or gray, depending on availability. Price and participation may vary so it may not be available at your local Costco or it may not be on sale at your local Costco or it may be a different price at your local Costco. Prices & sales dates may change at any time without notice. Photos may not be a perfect representation of the product. Description of product is garnered from product packaging. This is not a product review.